In the tech sector the TIN Report ranks companies in terms of revenue and celebrates their success, with many of those featured using the acknowledgement to attract Government assistance. In the telco sector, the honour of ranking the sector by the largest revenue earners is reserved for the regulator, and while there is a certain glory in making the list, for telcos it results in probably more pain than gain. I'm referring to the Telecommunications Development Levy - the $50 million that is extracted by the Commerce Commission from the telco sector each year to help fund the roll out of rural broadband. Before the TDL came along there was the Telecommunications Service Obligation, which resulted in all the telcos effectively paying Telecom (now separated into Spark and Chorus) to support a rural landline network. The TDL was legislated into being in 2011, and it states that $50 million must be raised each year from all telcos earning in excess of $10 million annually. As the Commission explains in its release, "the Government uses the annual levy to pay for telecommunications infrastructure and services which are not commercially viable including the relay service for the deaf and hearing-impaired, broadband for rural areas, and improvements to the 111 emergency service." This year 17 organisations (or "persons" as the Commission describes them in its draft decision) are liable. With Voyager and MyRepublic making the TDL list for the first time. It is a bittersweet acknowledgement as it will mean they have to pay $106K and $38K respectively (unless they can successfully argue otherwise in submissions on the determination). 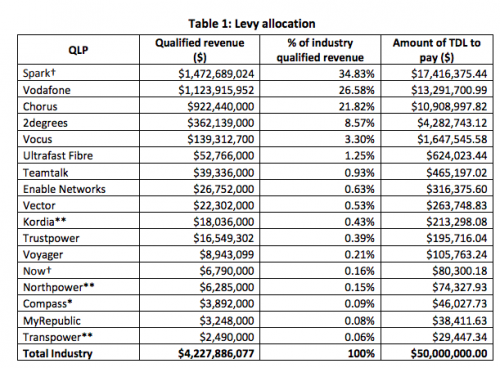 The bulk of the levy - over 90% - will be paid by Spark, Vodafone, Chorus and 2degrees. What is striking about the list is how much the telco industry remains concentrated in the hands of a few players. The top three companies - Spark, Vodafone and Chorus - make up over 85% of all revenues. While telcos are often keen to talk up a competitive sector with multiple companies competing, the Commission's annual TDL determination tells the full story. There might be a lot of companies in the game, but for many their revenues - and hence the amount they can invest to be competitive - are small when compared to the sector's traditional players. The Commission's draft decision is here.